Forget hotels. Get a Disneyland Timeshare Rental. Don't ruin it by stuffing everybody into a little hotel room! 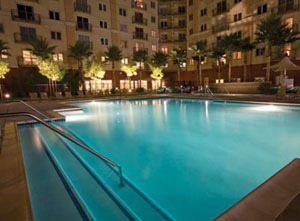 As a timeshare owner, I have access to a Disneyland timeshare rental, Worldmark Anaheim. It's a fabulous, spacious hotel alternative, located less than two miles from Disneyland. Where is the Worldmark Anaheim? What else is there to do in Anaheim? Where is the Disneyland timeshare rental? What else is there to do in Anaheim -- and Los Angeles -- while staying at the Disneyland timeshare rental? 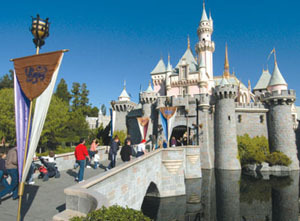 Anaheim is most famous for Disneyland, but there is plenty else to do while staying at the Disneyland timeshare rental! Directly across from Disneyland's entrance is Disney's California Adventure. Visiting California Adventure is a delightful way to experience a Disney-fied version of all that California has to offer -- minus the traffic! Angel Stadium is located just a few miles east of Disneyland. Practically across the street from the Stadium on the Honda Center, where you can watch the Anaheim Ducks! Addicted to golfing? You're in luck! There are five courses in Anaheim and the surrounding areas. You can visit the Crystal Cathedral, just a couple miles south in Garden Grove. And of course, Southern California is famous for its beaches. Just head west! You can't miss it! What restaurants are near the Disneyland timeshare rental? Just across from Worldmark Anaheim is the Anaheim Garden Walk where you'll find a number of popular restaurants including PF Chang's, The Cheesecake Factory, Johnny Rocket's, California Pizza Kitchen, Bubba Gump Shrimp Co., Bar Louie Tavern & Grill, Roy's Hawaiian Fusion Cuisine, FiRE + iCE, McCormick's & Schmick's Grille, and Pop the Cork Wine Bar. You'll also find a 7-11 about a block away to get your Slurpee fix. See a list of some of the most popular restaurants near Dolphins Cove, including addresses, phone numbers, and reviews! What is the Disneyland timeshare rental like? Far larger and friendlier than a hotel, getting a Disneyland timeshare rental is like having your own apartment just over a mile from Disneyland. This resort has Jacuzzis on the roof. 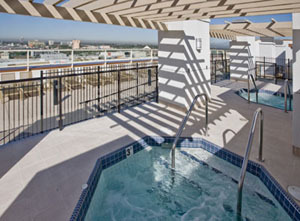 Can you imagine a more amazing spot to watch Disneyland's nightly firework show than from your rooftop Jacuzzi? You'll also find five full-size barbeques. Many people enjoy grilling their own steaks and burgers and then taking their food back to their room to eat. Of course, you can also eat outside. If you time it right and have a late dinner, you can eat it up on the rooftop lounge while you watch the Disneyland fireworks. I hestitate calling this "walking distance" because different people have different definitions for walking distance. For me, this just-over-a-mile distance is definitely walking distance, which is great because it saves me from having to park at Disneyland. Don't want to walk (and don't want to pay to park at Disneyland)? For just a few dollars, you can catch the shuttle (called the ART) that runs every 30 minutes to and from the Park! Buy your tickets in the lobby to save time. 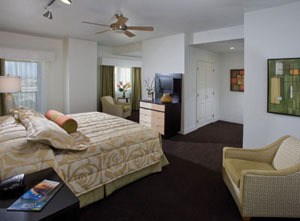 The Worldmark Anaheim has a large heated (heated!) pool, which is particularly nice as yes, even southern California can be chilly at night. Near the heated (heated!) pool is the kiddie pool, plus two more Jacuzzis. 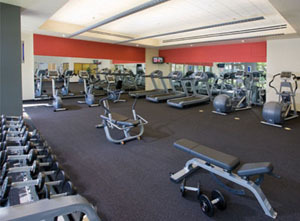 The Disneyland timeshare rental also has a nice newer 24 hour fitness center with large windows that overlook the street so that you can people-watch from a respectable distance. You'll also find a Rec Room with some cool video games, including some motorcycle and car racing games. You'll also find a ping pong table and vending machines. Worldmark Anaheim also puts on special events, such as Bingo Night, Movie Night. Sometimes they make special treats available, like root beet floats, hot dogs, and nachos! You'll also be able to use a 24 hour business center for all your printing needs. The resort has its own free parking garage adjacent to the resort. One nice touch you'll find at the Disneyland timeshare rental is a donation box near the front desk. If you find that you have some food that you didn't use, you can place it in the box and the resort staff will make sure that it gets donated to a local shelter. You can also get free coffee all day long in the lobby! Okay, so there are a LOT of great things about staying at the Disneyland timeshare rental, but there are a couple of things that I'd like you to know in advance so that you're not surprised. You'll want to make sure you bring your own soap, shampoo, and conditioner, as they are not provided. There is a little 24 hour gift store in the resort where you can purchase these things. I always like bringing my own anyway because I know what I like. The resort has really solid construction, which is a big plus in the case of an earthquake, but a big negative when it comes to using the wi-fi. Ask at the front desk about using a router instead. What are the rooms like at the Disneyland timeshare rental? 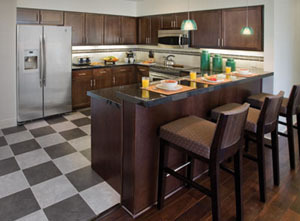 Worldmark Anaheim has many different unit sizes to accommodate most parties. If you have an large party, consider renting multiple units. 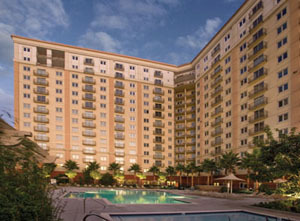 If someone in your party would like an ADA-compliant unit, take a look at Worldmark Anaheims' Special Needs units. If your desired unit is not available, but a special needs unit is, of course I will let you know! Four Bedroom Presidential: King in master, king in second, twins in third, twins in fourth bedroom. Maximum Occupancy 8. Three Bedroom Presidential: Presidential - Three Bedroom: King in master, king in second, twins in third bedroom. Maximum Occupancy 6. Three Bedroom: King in master, queen in second, twins in third bedroom, queen sleeper sofa in living area. These units have street views. Maximum Occupancy 8. 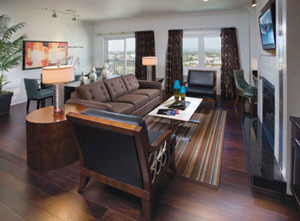 Two Bedroom Twin: King in master, twins in second bedroom, queen sleeper sofa in living area. Maximum Occupancy 6. Two Bedroom Presidential: Presidential - Two Bedroom: King in master, queen or twins in second bedroom. Maximum Occupancy 4. Two Bedroom Queen:King in master, queen in second bedroom, queen sleeper sofa in living area. Maximum Occupancy 6. One Bedroom:King in master, queen sleeper sofa in the living area. Maximum Occupancy 4. Studio: Queen murphy bed in living area. Limited kitchen including 2-burner stove, microwave, dishwasher and full fridge, no ovens. These units have street views. Maximum Occupancy 2. Four Bedroom Presidential Special Needs: King in master, king in second, twins in third, twins in fourth bedroom. Roll-in shower. Maximum Occupancy 8. Three Bedroom Special Needs: King in master, queen in second, twins in third bedroom, queen sleeper sofa in living area. Roll-in shower. Maximum Occupancy 8. Two Bedroom Presidential Special Needs: King in master, queen in second bedroom. Roll-in shower. Maximum Occupancy 4. Two Bedroom Queen Special Needs: King in master, queen in second bedroom, pull out queen sofa in living area. Roll-in Shower. Maximum Occupancy 6. Studio Special Needs: Queen murphy bed in living area. Limited kitchen including 2-burner stove, microwave, dishwasher&full fridge, no ovens. Roll-in shower. Maximum Occupancy 2. How much will it cost to rent the Disneyland timeshare rental? 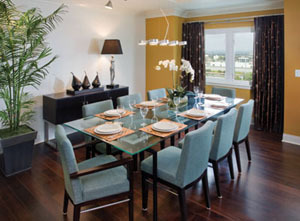 The Disneyland timeshare rental is popular year-round; all dates are considered to be in the High Season. Rates vary according to the unit size, and according to which days of the week that you're there. Want to read what others have said about staying at the WorldMark Anaheim? 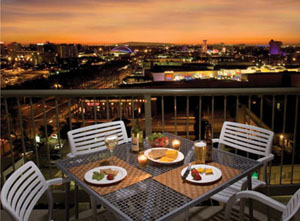 Read WorldMark Anaheim Reviews. Worldmark Anaheim is my most popular timeshare. It tends to book far in advance. The further out you plan your Anaheim vacation, the greater likihood that your dates will be available! Would you also like me to check the nearby Dolphin's Cove resort? It's about 1 mile south of this resort.